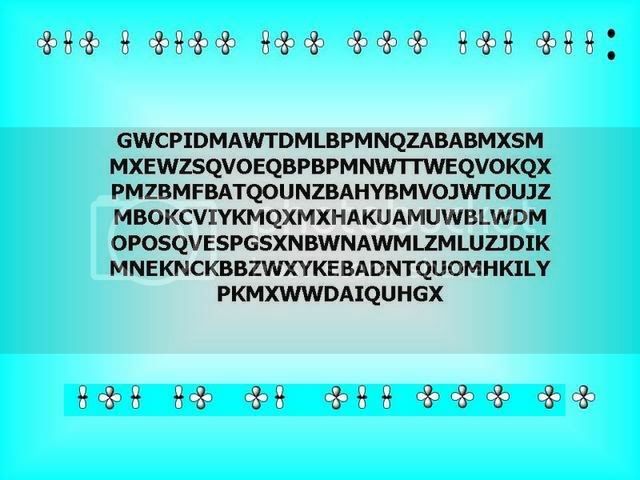 Thread: Can you solve this puzzle? Nope, but I think there is a mistake in the second line of symbols. You are right Brady, thanks. I fixed the mistake so it should be ok now. Oh, and I think you can solve it. gabi, i got the top line, the rest hasn't made sense. i'm not seeing a change in the original image. Press F5 and you should see the new image. The last 5 symbols in the second line should all be the same one. It is too early to be giving clues so all I can tell you is to do what that first line tells you to do. i am currently completely stuck and confused. Corgi apparently is not confused any more. I got two correct answers within one minute of each other. Knocka and and corgi are the first two solvers. I will give one more day in case someone else is still working on it and will start giving hints. fun puzzle gabi, thanks. i am looking forward to the next one. thanks. I enjoyed the puzzle too, gabi. Thanks.